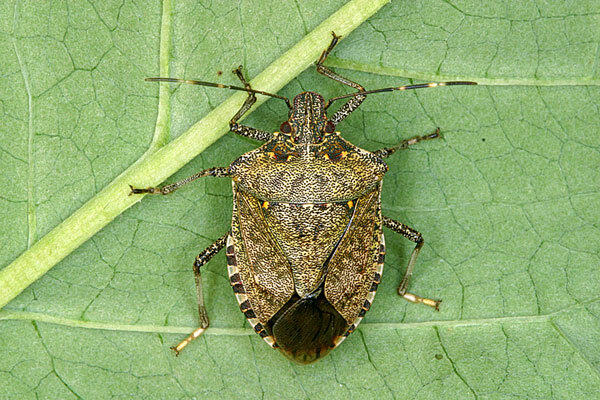 The Brown Marmorated Stink Bug has a "shield" shaped body that is characteristic of all stink bugs. 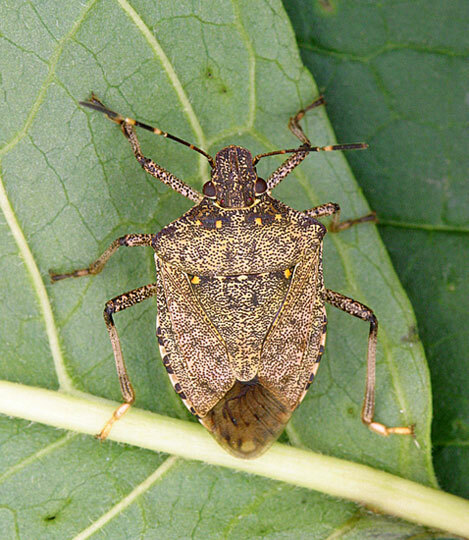 The adults are approximately 17 mm (5/8 inch) long with a mottled brownish grey color. The next to last (4th) antennal segment has a white band and several of the abdominal segments protrude from beneath the wings and are alternatively banded with black and white. The underside is white, sometimes with grey or black markings, and the legs are brown with faint white banding. 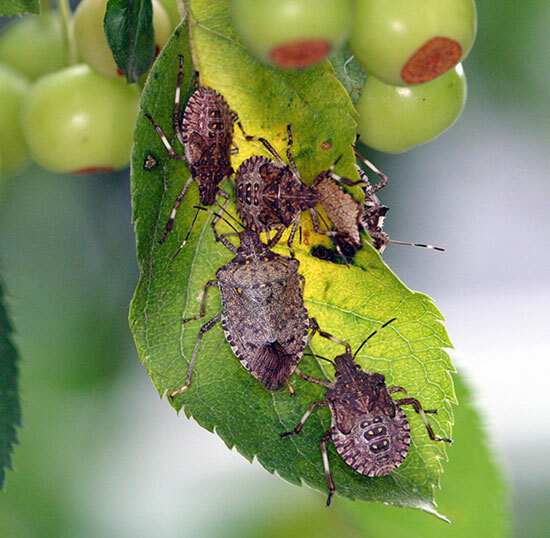 The Brown Marmorated Stink Bug has five nymphal stages, or instars, and ranges in size from 2.4 mm to 12 mm in length. Unlike the adults who blend in very well with bark, the nymphs are more brightly colored with red and black. 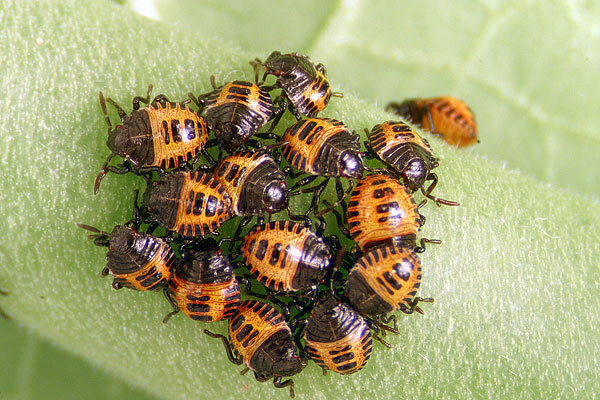 The first instars, which have a "tick-like" appearance, are not very active and remain around the hatched egg mass. 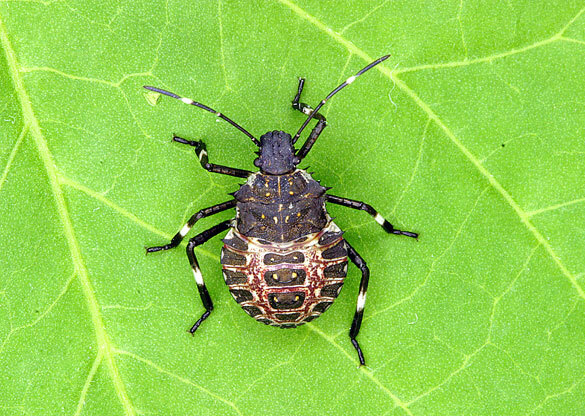 Nymphs are characterized by dark reddish eyes and a yellowish-red abdomen that is also striped with black. The legs and antennae of the nymphs are black with white banding. 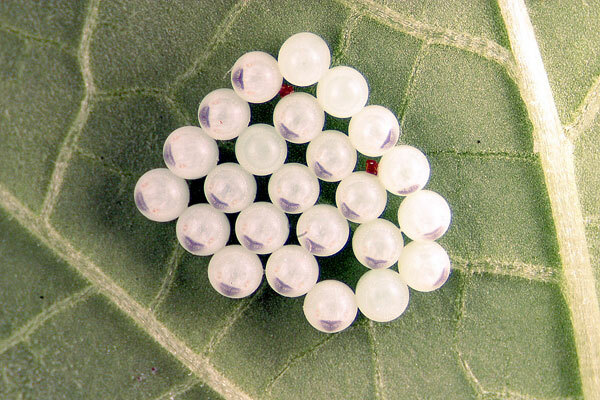 The eggs of the Brown Marmorated Stink Bug are often laid on the underside of leaves and a light green in color. They are elliptical in shape and are often deposited in a mass of approximately 28 eggs.